Fractal stripe. 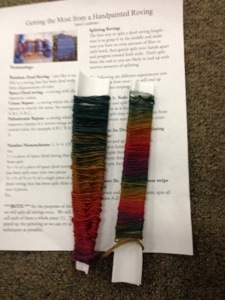 Take two whole pieces of space dyed fiber. Split in half. Spin one piece as is. 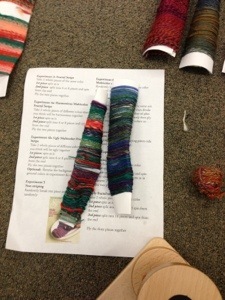 Split other piece into 4 slender strips and spin from the end. Then ply the two together. 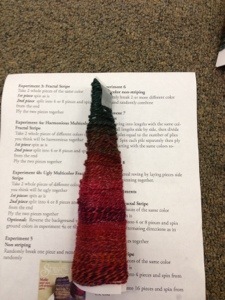 Multicolor fractal stripe. 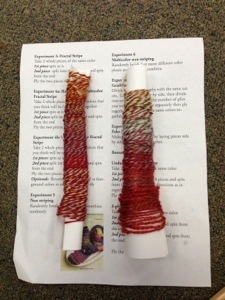 Two different space dyed rovings. They take turns being background and foreground in these two samples. Fake Noro: make a staggered roving by laying pieces side by side, predrafting them a bit to mix them, then spinning them together. 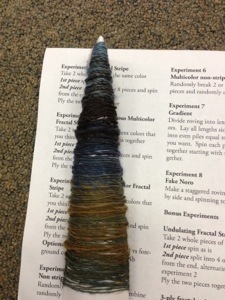 Gradient: divide roving into lengths with the same colors. Lay all lengths side by side then divide into even piles equal to the number of plies you want. Spin each pile separately then ply starting with the same colors together. Three colors drafted together in different ways. 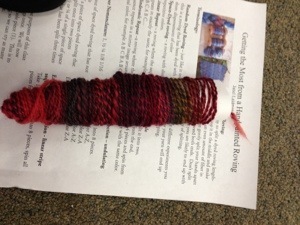 Four colors drafted together and plied. Q – Cool! I didn’t know the vocab for this before. 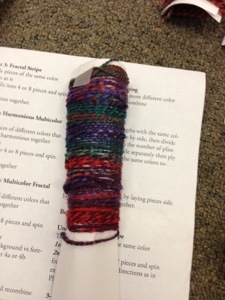 Did you separate the colors in the Linear or did you chain ply to keep the colors together? Those are just singles. We started plying experiments after that. Great work and wonderful visuals. Thanks for the quick lesson! Crazy! Sure creates some fun results too.